The most famous and popular of all the clowns in harlequinade and pantomime was Joseph Grimaldi. Despite his Italian name and family origins, he was born in London in 1779, dying in 1837. 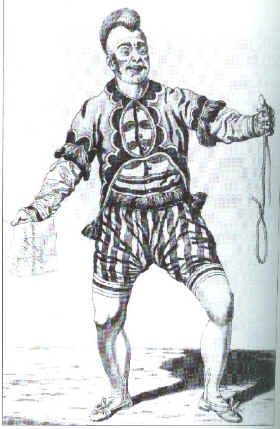 His style of clowning had its origins in the Italian commedia dell'arte of the sixteenth century, but in the popular Harlequinades of the early nineteenth century he emerged as the founding father of modern day clowns. To this day he is commemorated annually by clowns in their own church, Holy Trinity in Dalston, East London. Joseph Grimaldi was the original 'Clown Joey', the term 'Joey' being used to describe clowns since his day. Of his own name he punned 'I am grim all day - but I make you laugh at night!' 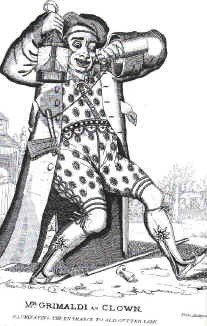 Grimaldi became the most popular clown in pantomime, and was responsible for establishing the clown as the main character in the Harlequinade, in place of Harlequin. His career began at the age of three at the Sadler's Wells Theatre. He was later to become the mainstay of the Drury Lane Theatre before settling in at Covent Garden in 1806. His three year contract paid him one pound a week, rising to two pounds the following year, and finally three pounds a week. His debut at Covent Garden was in 'Harlequin and Mother Goose; or the Golden Egg' in 1806. Grimaldi himself had little faith in the piece, and undoubtedly it was hastily put together on a sparsely decorated stage. However, the production ran for 92 nights, and took over �,000. In 'Harlequin and Mother Goose' there were four opening scenes, involving Grimaldi as Squire Bugle (afterwards, the clown) Mother Goose, played by Mr. Simmons, Colin (afterwards Harlequin) in love with Colinette. This was then followed by fifteen scenes of Harlequinade, and a grand finale. Music ran throughout the piece, and there was no spoken dialogue. In 1812 Joseph Grimaldi donned the skirts of Queen Ronabellyana in 'Harlequin and the Red Dwarf'. He was later to play the Baroness in 'Harlequin and Cinderella', and it could be said that he began the slow transition from clown to pantomime dame, although the 'Dame' was not to fully emerge until the period from 1860-1880 with the emergence of the music hall stars. Grimaldi made famous several songs, the most popular of which was 'Hot Codlins'. The song tells of an old lady who sold roast apples and drank too much gin. The audience shouted out the last word with glee, as Grimaldi would look at them and say 'Oh! For Shame!'. This song continued to delight pantomime audiences over the years, and was one requested at his farewell benefit performances. In 1823 Joseph Grimaldi was forced to retire, through ill health and exhaustion. He was forty five years old. The years of acrobatic jumping and tumbling had taken their toll, and he was scarcely able to walk. 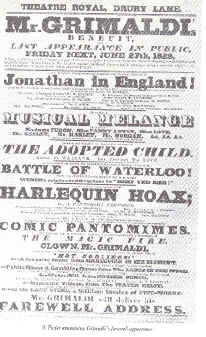 By 1828 he had become penniless, and a benefit performance was held at both Sadlers Wells, and Covent Garden. In his farewell speech he told his audience 'Like vaulting audition, I have overleaped myself and pay the penalty in advanced old age. It is four years since I jumped my last jump, filched my last oyster, boiled my last sausage and set in for retirement'. His last years were helped by these benefit performances, and by a pension of �0 a year from the Drury Lane Theatrical Fund. Virtually unable to walk, his last years were spent beside the fireplace of 'The Marquis of Cornwallis' tavern, in Pentonville, where each night he would be carried home on the back of the landlord, George Cook. On the evening of May 31st 1837 he returned home, and died during the night. 'Grimaldi is dead and hath left no peer' said the London Illustrated News. It continued 'We fear with him the spirit of pantomime has disappeared'. 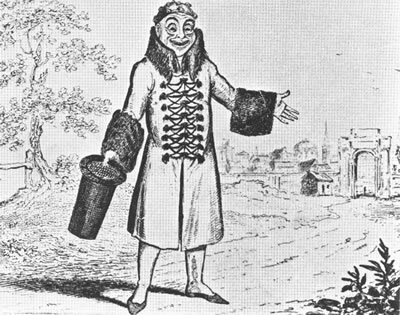 'The Garrick of Clowns' was buried in the courtyard of St. James's Chapel, Pentonville. Charles Dickens, who put Grimaldi's memoirs in order said 'the clown left the stage with Grimaldi, and though often heard of, has never since been seen'. You may either choose to print this page out from the website or download them as WinZip / Adobe Acrobat files. Visit our DOWNLOAD CENTRE for details on how to obtain these documents.